The Knitting and Stitching Show in Harrogate has been a yearly treat ever since I first went there. It’s a chance for friends to gather to talk about embroidery (or anything else, in the case of my lunch with Elizabeth from Sew In Love Stitch Art!) or to make new friends, to stock up on weird and wonderful materials you can’t get anywhere else, and to look at exhibitions and go to workshops. Oh, and I have breakfast in Bettys of Harrogate, which is a treat in itself! This year I had a very short shopping list, and managed to get almost all of it on Thursday night! 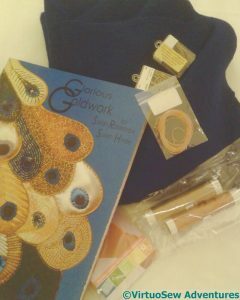 I got a copy of the new Goldwork book produced by Sarah Rakestraw and Susan Hinde of Golden Hinde Goldwork – signed by the authors, no less! – as well as having a long conversation with them both that resulted in a few ideas for unlocking my logjam with Akhenaten. I also bought a couple of threads that I hope will make it possible to try again to create the uraeus on his crown. The book is a good, thorough work of reference that will be very useful in the future. Yes, I know I already have others, but you would be amazed how often someone’s explanation fills in the gap in someone else’s! 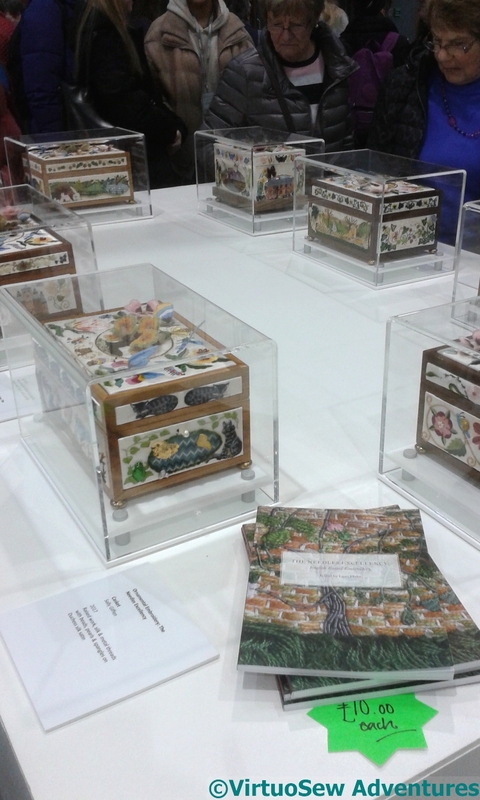 One of the really striking exhibitions was entitled The Needle’s Excellency, a display of stumpwork caskets worked by Nichola Jarvis and her students at the Ashmolean Museum. They are beautifully worked, the tops all largely similar, and all the sides worked in different designs created by the students from episodes in their lives or motifs they particularly liked. I believe there are thoughts of running the course again in a couple of years, so if you are interested, keep an eye open! 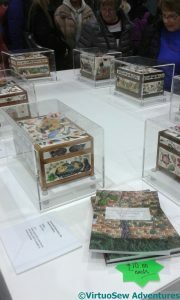 Finally, there was, of course the Harrogate edition of the “100 Hearts” project of the Embroiderers Guild. There were some old friends I recognised from the exhibition in Liverpool, but most of them were new to me, and there were some fantastic pieces of work, providing food for thought and some pointers to yet more untold stories. That was a remarkably restrained shopping trip! But a haul full of Really Useful Stuff which you already need rather than Things That Looked Good on the Stall and loads of Things I Might One Day Find A Use For, which is what I have a bad habit of lugging back from shows and then lurk in drawers and glare at me for years. I spy some Japanese silks. What did you get? What a wonderful day out, and it sounds like you learnt things as well as bought things! There isn’t really a comparable show here in Sydney, I will just have to time my visits to the UK I guess! It would have been wonderful to have seen th caskets and hearts. I remember reading about the caskets course and just dreaming. All in all, it sounds very inspiring! Always worth going anywhere for the chance to eat at Betty’s! That glimpse of the stumpwork boxes is very tantalising – mostly I don’t regret deciding not to go this year but I do wish I could have seen them! Sounds like the perfect day. How good to get some advice too to help you with your work. Those boxes look amazing. I am sure it was a wonderful visit, meeting up with friends, getting and exchanging ideas with fellow stitchers. Then as you say, there is the chance of getting all on one’s shopping list in one place. That is what I call a treat `to stock up on weird and wonderful materials you can´t get anywhere else´ have tea at Betty´s, admire the stumpwork caskets and `fantastic pieces of work providing thought´. Wonderful outing. The Goldwork book sounds interesting and the caskets look amazing. Sounds like a great day out! The show looks like a wonderful place to find inspiration. I’m glad you had that great conversation that is helping unlock the flow of the Akhenaten piece. What with travel, computer problems and illness I am way behind. But I have had a wonderful day catching up with your blog posts. (up till now all the comments have been closed.) I love Betty’s and have stood in line at th York store many times or just stood and drooled at the cake display.